Spycra Protect is a soft, one-sided silicone adhesive dressing. Spycra Protect is a bi-elastic dressing; elastic in both directions – in the length and in the width -, can be repositioned and has rounded edges to stay better in place. The bi-elasticity diminishes the effects of friction preventing the appearance of skin lesions in case of fragile skin (prevention of skin tears, scratch wounds,…)or in case of skin@risk (prevention of blistering when walking, running, ….) The wide scaled pore structure of the dressing allows the dressing to breath and supports an optimal wound healing process based on the principle of moist wound healing. Top layer of lycra fibers, giving the dressing a silken-like look. Does not absorb. Minimal risk to get friction wounds. Can be used on fragile -thin- skin. Minimal risk to develop skin tears. No leakage; increased patient comfort. Increased comfort for the care giver. No pain and trauma/secondary skin lesions ( loss of epidermis )when changing the dressing. Dressing can be re-positioned allowing safe and easy wound inspection during care process. No adhesive residue on the skin after removal of the dressing. Minimal risk for skin irritation or allergy. Perfect sealing of wound edges; no risk for maceration of surrounding skin. Painless dressing changes; increased patient comfort. Easy removal of the dressing; less time spending. No risk for maceration wound edges; the surrounding skin stays dry and healthy. Minimal dressing changes; minimal risk for damaging newly formed tissues. No maceration of surrounding skin; increased patient comfort. No maceration of wound edges. Long wear time; stays well in place. Many applications; minimal risk when used on wounds with. No secondary dressing needed to protect dressing ; Dressing doesn’t stick to bed linen. One sides adhesive>>no extra fixation dressing needed; increased patient comfort, less manipulation of dressings, lower cost for dressing changes & easy to use. Less manipulation; faster application >> less time spending. The soft silicone layer and the bi-elastic top layer secure a perfect support of fragile skin. The bi-elasticity minimizes the shearing and traction forces on the skin, limiting the risk of secondary skin lesions. The wide scaled pore structure of the dressing allows the dressing to breath; transpiration can evaporate limiting the risk of maceration. The dressing can easily be re-positioned without loss of adherence. The dressing can stay in place for several days and can, if needed, be removed as pain free as possible. The soft silicone layer seals off the wound edges avoiding maceration and keeping the surrounding skin dry and healthy. The wide scaled pore structure of the dressing allows excess of wound fluid to pass vertically towards an outer absorbent dressing. The outer dressing needs to be changed if needed and limits the risk of maceration; change frequency depends on the condition of the wound and the amount of wound exsudate. The integrity of the dressing and the features of the soft silicone layer allow the dressing to stay in place for several days. The soft and perfect adherence on the skin secures no loss of epidermis during dressing changes. This makes the dressing changes as pain free as possible. As protective dressing to support fragile skin (skin at risk) ; support of underlying fragile skin tissues , limiting the risk for appearance of skin tears. As protective dressing to diminish the friction and shearing forces with bedridden patients, wheelchair and prosthesis users avoiding skin lesions. Note: In case of exuding wounds, it is recommended to apply a secondary absorbent dressing op top. Clean the wound carefully, if needed, and dry the surrounding skin. Choose a size of Spycra Protect that covers the wound and the surrounding skin by at least 2 cm. Spycra Protect can be cut to size, if needed, before removing the protective films. It is preferable to use a larger size instead of several – overlapping – small sizes to secure a perfect adherence. (Spycra Protect does not secure a proper adherence when overlapping ; it is not recommended to overlap several small sizes). Hold Spycra Protect with the protective film and adhesive layer upwards. Before removing the protective film, it is recommended to gently stretch the dressing in order to have a better grip on the cutting line. Fold the dressing with the opened cutting line upwards and rub softly the already removed parts of the protective layer. The rubbing facilitates the removal of the protective layer from the dressing. The protective paper can now be easily be gripped at both sides of the cutting line. Hold, at the same time, a top of the undulation at the left side of the cutting line (with the left hand) and one at the right side (with the right hand). Remove the protective film by tearing evenly the left side and the right side . Be sure approximately 1 to 2 cm of the protective film still protects Spycra Protect before the dressing is applied on the wound or on the fragile skin (see point 4). Moisten gloves to avoid adherence to Spycra Protect. If Spycra Protect on roll is used, it is recommended to cut the protective film between the precuts . Make sure that the distance of the new cut to the precut is sufficient in order to remove easily the protective layer before applying the dressing. 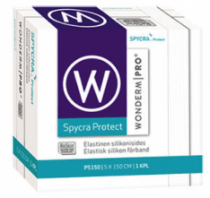 Apply Spycra Protect on the wound (or on the fragile skin which needs protection) and gently smooth Spycra Protect in place onto the surrounding skin, ensuring a good seal. Remove the remaining protective film. Make sure that Spycra Protect is applied in a normal way (not stretched). If necessary, the dressing or part of the dressing can be removed and repositioned. Where clinically indicated, treatments such as topical steroids, topical antimicrobials or hydrogels can be applied over or under Spycra Protect. Applying hydrogels, creams or ointments under Spycra Protect compromises the adherence of the dressing; it is recommended to put a extra outer fixation dressing on top of Spycra Protect. If used on a heavy exuding wounds, apply a bandage or an outer absorbing dressing on top of Spycra Protect . Ensure sufficient – absorbent -padding is applied if used on deeper wounds. If used on a dry skin surface or if used on a moist, not heavy exuding wound, no extra secondary dressing is needed. The soft, silken-like top layer does not stick to the bed linen. The soft silken-like top layer and the rounded edges ensure a perfect stay on the wound or on the fragile skin; the dressing does not roll. The bi- elasticity of Spycra Protect ensures a perfect fit if applied on jointed or contoured areas (e.g. under arm, under breast, inner elbow, groin,…). It is recommended to use a dressing which has a larger size to have a perfect seal. The bi-elasticity of Spycra Protect limits the risk of traction on the skin avoiding secondary skin lesions . If a outer secondary non- adhering dressing is used on top of Spycra Protect, a large fixation dressing or bandage can be used to have an optimal fixation. Spycra Protect can be used under compression bandages. Spycra Protect is primarily indicated for superficial non to low exuding wounds. If used on exuding wounds, some fluid accumulation may be seen under the dressing increasing the risk for maceration of the wound and/or wound edges. Spycra Protect used on burns, treated with meshed grafts: avoid placing unnecessary pressure upon the dressing. When Spycra Protect is used for the fixation of skin grafts and protection of blisters, the dressing should not be changed before the fifth day post application. Moist skin or heavy transpiration can diminish the adherence of Spycra Protect. Before applying the dressing, make sure the skin is dry. Primarily to be used on skin at risk and on a wide range of superficial wounds ( see applications ). Therefore, they are an excellent choice for usage in nursing homes, hospitals and home care. Published studies show that patients, treated with soft silicone dressings, have significant less pain when dressings are changed. Studies also show an increased patient comfort, less maceration of the wound edges and surrounding skin compared to traditional dressings. As a consequence, the use of soft silicone dressings is very economic for the patient. Soft silicone dressings can be described as a-traumatic dressings; clinical studies have shown that these kind of dressings can be a-traumatic removed without causing pain and without causing secondary lesions of the wound bed or surrounding skin. In case of clinical signs of infection, the use of silicone dressings can be continued in combination with an appropriate medical treatment ( anti-microbial treatment ). The wound should be inspected for signs of infection according to clinical practice. An international advisory board of ‘scar-management’ experts have recently published a list of ‘evidence-based’ suggestions whereby the use of silicone gel dressings could be the first choice for immature, linear or general hypertrophic scars after burns and smaller keloids. Quite some clinical articles are published in regard to the properties of silicones and the use of silicone dressings. Banks, et al., 1994a; this study demonstrates that in regard to wound healing, a soft silicone dressing is significantly performing better than a hydrocolloid dressing. Banks, et al., 1994a, 1994c; this study demonstrates that a soft silicone dressing is significantly easier to remove than a hydrocolloid dressing. Banks, et al., 1994c; this study demonstrates that a soft silicone dressing causes significantly less pain than a hydrocolloid dressing. Banks et al. 1994a, 1994c; soft silicone dressings are easier to use than hydrocolloid dressings. A Study to Compare a New Self-Adherent Soft Silicone Dressing with a Self-Adherent Polymer Dressing in Stage II Pressure Ulcers; VOLUME: 49- Issue Number: 9.
author: Sylvie Meaume, MD, PhD; Dirk Van De Looverbosch, MD; Hilde Heyman, RN; Marco Romanelli, MD, PhD; Andrea Ciangherotti, MD; and Sylvie Charpin, MD. Clinical experiences with a new single-sided adherent silicone dressing (SPYCRA PROTECT®) for the CARE of superficial, acute and chronic wounds and for ‘skin@risk’.